This initial stream of Reynolds' work, which was described in the terms used above by his most famous student, J.J. Thomson, clearly stemmed from interests developed as a result of his background and experience prior to coming to Manchester. It was convenient as an initial area for research in view of the fact that little was available to him at that time in the way of laboratory and workshop facilities at Owens College. In addition it provided ideal material for lectures of general interest and popular appeal for presentation to the Manchester Literary and Philosophical Society. The papers on this aspect of his work, which are all to be found in Volume I of the Collected Works, deal with matters concerned with comets; the solar corona and the aurora; terrestrial magnetism; the electrical properties of clouds; the bursting of trees struck by lightning; the destruction of sound by fog; the refraction of sound by the atmosphere; the action of rain to calm the sea; the action of oil on water in preventing wind waves; surface tension and capillary action. The earliest of these, Papers 2, 3A and 3B (1870-1872), are all closely related. In Papers 2 and 3A the tails of comets, the solar corona and the aurora are considered as electrical phenomena. 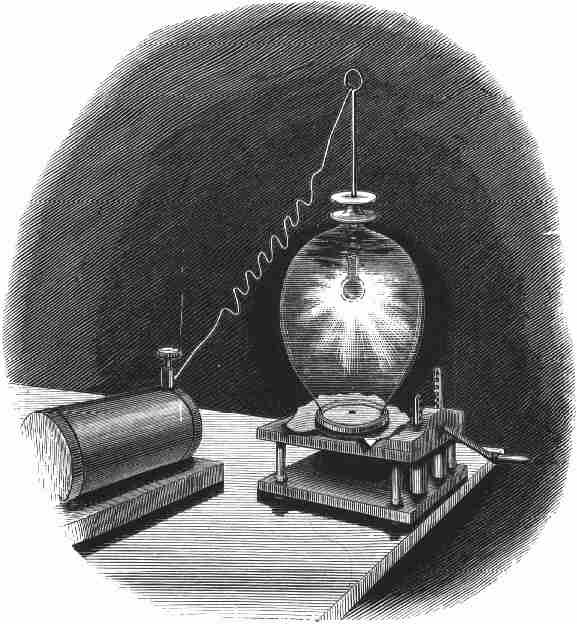 In Paper 3B (1872), a corona resembling the solar corona produced by discharging electricity from a brass ball in a partially evacuated receiver is described (see Figure 1). In Paper 4 (1872), the induction of static electricity on the part of the sun is proposed as a probable cause of terrestrial magnetism and in Paper 5 (1872) the inductive action of the sun on the electrical properties of clouds is considered with respect to thunderstorms. Paper 7 (1873) `On the bursting of trees and other objects struck by lightning' reports an experiment showing that the explosive effect of a lightning strike is due to the rapid evaporation of moisture into steam. In Paper 7A (1873) Reynolds deals with the destruction of sound by fog explaining it in terms of the resistance to motion of air when charged with small droplets of water. 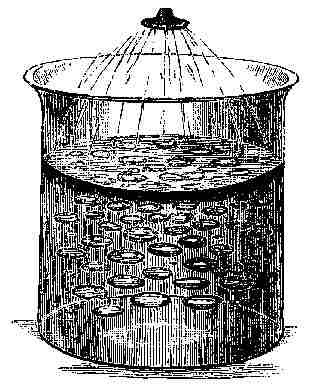 In a presentation to the Manchester Literary and Philosophical Society, `On the action of rain to calm the sea' (Paper 15, 1875) Reynolds showed by experiment that vortex rings produced by droplets of rain cause water to be carried well below the surface in appreciable amounts leading to the damping of wave motion (see Figure 2). Papers 29 (1875) and 30 (1877) deal with the formation of raindrops, hailstones and snowflakes. Reynolds points out that hailstones are formed by the aggregation of small frozen particles resulting from coalescence with more rapidly descending larger particles. To prove it he ingeniously produced artificial hailstones by chilling a flow of air laden with tiny droplets of water through the use of an ether spray (see Figure 3). In a paper read to the British Association in 1880 `On the effect of oil in destroying waves on the surface of water' (Paper 38), Reynolds attributes this to the surface tension varying inversely with the thickness of the oil film as the wind flows over it. This introduces tangential stiffness which prevents the surface taking up the motion of the water beneath. The effect is a dynamic one; instead of wave motion occurring in the water, eddies are formed below the surface. At the centennial British Association meeting held at York the following year Reynolds developed his ideas `On surface-tension and capillary action' still further (Paper 39). On October 4th 1881 Reynolds made a short presentation to the Manchester Literary and Philosophical Society `On the floating of drops on the surface of water depending only on the purity of the surface' (Paper 40). In this Reynolds reported experiments using powder in the form of flowers of sulphur to determine the circumstances under which such drops are suspended. This is a part of Osborne Reynolds' work which is not as widely appreciated now as it deserves to be. It was, however, of considerable interest within the Victorian scientific community and it was for his early efforts in this area that Reynolds was elected a Fellow of the Royal Society in 1877. Featuring in both Volumes I and II of the Collected Works, his papers deal with forces at a surface caused by evaporation; condensation and heat transfer; the transpiration of gases through porous media; the internal cohesion of liquids; the dilatancy of granular materials and the general properties of matter. Almost all of Reynolds' post-1877 publications on these matters were presented to the Royal Society. In Paper 11 (1874) Reynolds is concerned with the forces due to the evaporation or condensation of a liquid at a surface. Experiments conducted by him showed that evaporation caused a force tending to drive the surface back and condensation a force tending to drive the surface forward. The explanation of these effects is given using the kinetic theory model of gases. Papers 12 (1874) and 23 (1876) deal with forces exerted by the communication of heat to a surface immersed in a rarefied gas. Such forces are attributed to molecular influences and used to afford an explanation of the operation of the Crookes light mill (Figure 4), again using the kinetic theory model. The ideas involved led Reynolds to invent a simple photometer. Experiments on a light mill performed in collaboration with a colleague at Owens College, Arthur Schuster, demonstrated conclusively that the force which turns the vanes is not directly due to thermal radiation. 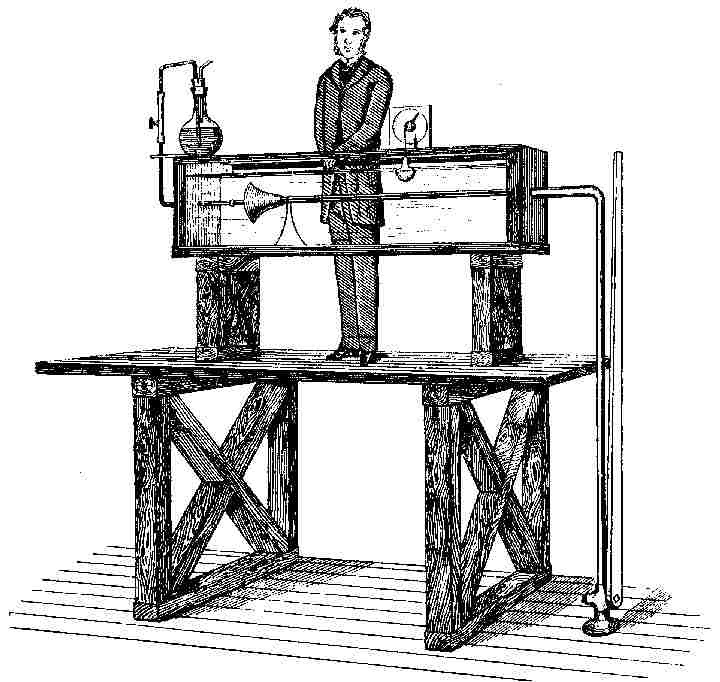 Reynolds' interest in the Crookes light mill was perhaps the initial stimulus for his thoughts on the so-called `transpiration' of gases. Graham had applied this term to the passage of gases through capillary tubes. 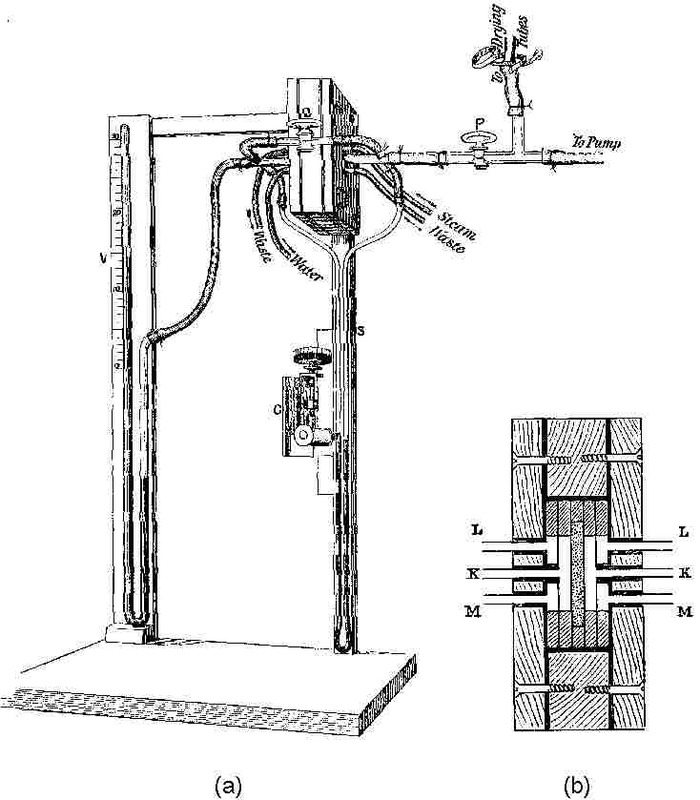 Reynolds re-applied it to describe the motion of gases through minute channels including porous plugs and apertures in thin plates as well as capillary tubes. The results of his 1879 investigation are presented in one of the longest and most original of his papers entitled `On Certain Dimensional Properties of Matter in the Gaseous State' (Paper 33). In this, he showed by theory and experiment (using the apparatus shown in Figures 5a and 5b) that not only would a difference of pressure cause a gas to flow from one side of a porous plate to the other, but so also would a difference of temperature, even when initially the pressures on the two sides were equal. To this phenomenon he gave the name `thermal transpiration'. In the same paper Reynolds also demonstrated that the extremely low pressure of the gas in the light mill was necessary because of the comparatively large size of the vanes and that similar results ought to be obtainable with smaller vanes at higher pressure. 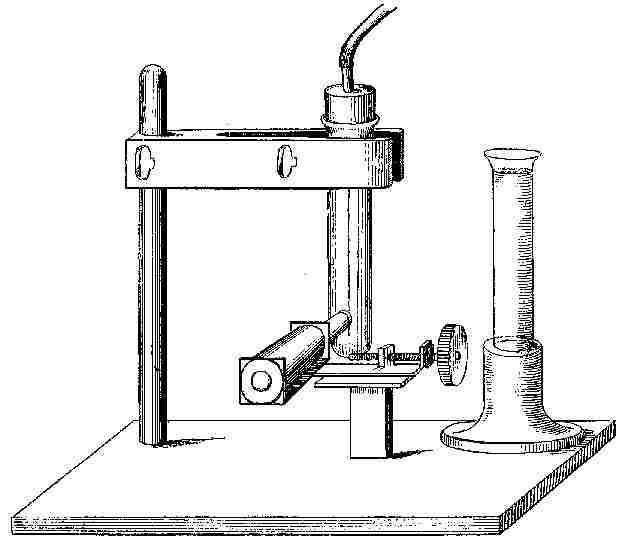 This he proved by experiments on fibres of silk and a `spider line' using the apparatus in Figure 6. He showed that, provided the pressure in the vessel containing the fibre was not more than approximately one-quarter of an atmosphere, the fibre moved towards an external source of heat. Advancement of the kinetic theory of gases was a notable feature of the science of the 1870s and one to which Reynolds made a significant contribution alongside more established figures such as Maxwell. A short note by Reynolds on thermal transpiration (Paper 34), written in response to a criticism of his ideas by Maxwell and communicated to the Royal Society by its Secretary Sir George Stokes in 1879, provides an intriguing insight into the very formal manner in which the scientific establishment operated. Reynolds' work on the surface forces due to heating and on thermal transpiration provided valuable experimental support for the developing kinetic theory (i.e. that `heat' is a manifestation of the molecules of which a gas is composed). Widespread acceptance of the theory by the scientific community did not come until much later. Reynolds' experiments and theoretical contributions in the period 1874 to 1879 were many years in advance of the time. It is of interest that one of Reynolds' students in his last years at Manchester, Sidney Chapman, was later to make further important advances in this field. Reynolds' interest in the physics of fluids extended to liquids. In Papers 31 (1877) and 35 (1880) delivered to the Manchester Literary and Philosophical Society he reported experiments on the internal cohesion of mercury and water. By careful exclusion of air he was able to suspend a column of mercury to a height of more than double that of the barometer (see Figure 7). A few years later he turned his attention to the properties of granular media. Reynolds' first announcement of the property of such media to which he attached the name `dilatancy' was made to Section A of the British Association at its meeting in Aberdeen in 1885. The paper attracted sufficient attention for him to be asked to read it again to Section B a few days later, and a printed version (Paper 50) appeared in the Philosophical Magazine in December of the same year with the title `On the Dilatancy of Media Composed of Rigid Particles in Contact'. A version also appeared in Nature due to the extent of interest. The British Association audiences must have been greatly intrigued by the strikingly simple but ingenious experiments which he performed and equally startled by the conclusions which he drew from them. He applied the term `dilatancy' to the property possessed by a mass of granular material to alter its volume in accordance with a change in the arrangement of its grains. His illustration of this in terms of the piling of spheres in two different ways is shown in Figure 8: the pile of spheres in cubical formation occupies a volume greater than that of the same number and size of spheres when piled in the second way. Reynolds went on to illustrate this by characteristically simple means. If an india- rubber bottle with a glass neck is filled with water and the bag is then squeezed, water will be forced up the neck. But if the bottle is full of granular material and water, the effect of squeezing, up to a point, is to draw water down from the neck into the bag, because the grains have adopted an arrangement in which the volume of the interstices has been increased. In Reynolds' words, `the result, but for the knowledge of dilatancy, would appear paradoxical, not to say magical... Sand presents many striking phenomena well known but not hitherto explained, which are now seen to be simply evidence of dilatancy'. A familiar phenomenon explained by Reynolds was that observed when a foot is planted on firm moist sand on the sea- shore: an area around the foot appears to become dry, however, when the foot is raised, the sand beneath is found to be abnormally wet. The pressure of the foot has increased the volume of the interstices between the grains of sand below it and water has been drawn in to occupy the additional voids. These were the thoughts in his mind in 1885. Indeed, the title of his discourse to the Royal Institution in February, 1886 (Paper 51), on the same property of granular material, contained the significant words `possibly connected with gravitation'. Seven years previously, a paragraph concluding his paper on dimensional properties of matter in the gaseous state had shown that his thoughts were turning towards the possibility of solving the riddle of the luminiferous ether. However, it was not until February 1902, that his memoir `On the Sub- Mechanics of the Universe' was communicated to the Royal Society. Osborne Reynolds is without doubt best known for his papers on fluid motion and turbulence which are to be found in both Volumes I and II of the Collected Works. The matters dealt with include: the progression of groups of waves; vortex motion; laminar and turbulent flow in pipes; the dynamical theory of fluid flow and, hydrodynamic lubrication. Amongst the papers are a number which have received universal recognition. Paper 27 (1877) is concerned with the progression in deep water of groups of dispersive surface waves and the rate at which energy is transmitted by them. Here Reynolds showed not only that the velocity of the group is one half that of an individual wave, as was already known, but that the group velocity also gives the rate of transmission of energy. In the same year Reynolds described methods for rendering the internal motions of a fluid visible by means of colour bands, a technique which he was to use later in his renowned experiments on transition (see below). This he did with particular reference to vortex motion, considering the vortex lines behind an oblique wave, the vortex ring behind an inclined disc, vortex rings caused by drops falling into water and by a `puff' of water. In 1883, Osborne Reynolds published his famous paper entitled `An experimental investigation of the circumstances which determine whether motion of water shall be direct or sinuous and of the law of resistance in parallel channels' (Paper 44). This paper, published in the Philosophical Transactions of the Royal Society, proved to be a classic in the literature of the science of fluid motion and had a profound effect on the development of fluid mechanics in the widest sense. It contained the enunciation of the dimensionless group, the Reynolds Number. The first step in Reynolds' discovery of this fundamental parameter appears to have been his observation that `the tendency of water to eddy becomes much greater as the temperature rises'. It occurred to him that this might be related to the well-known fact that the viscosity of water diminishes as the temperature rises, and moreover, that the physical property, kinematic viscosity, `is a quantity of the nature of the product of a distance and a velocity'. The story of his experiments using colour bands in glass tubes is well known. His final apparatus, so effectively portrayed by the well known illustration shown in Figure 9, consisted of a glass-sided tank, 6 feet long, 18 inches deep and 18 inches wide. Inside it was a glass tube with `a trumpet mouth of varnished wood, great care being taken to make the surface of the wood continuous with that of the glass'. On the right-hand side, the tube was connected to an iron pipe equipped with a valve which could be controlled by means of a long lever. 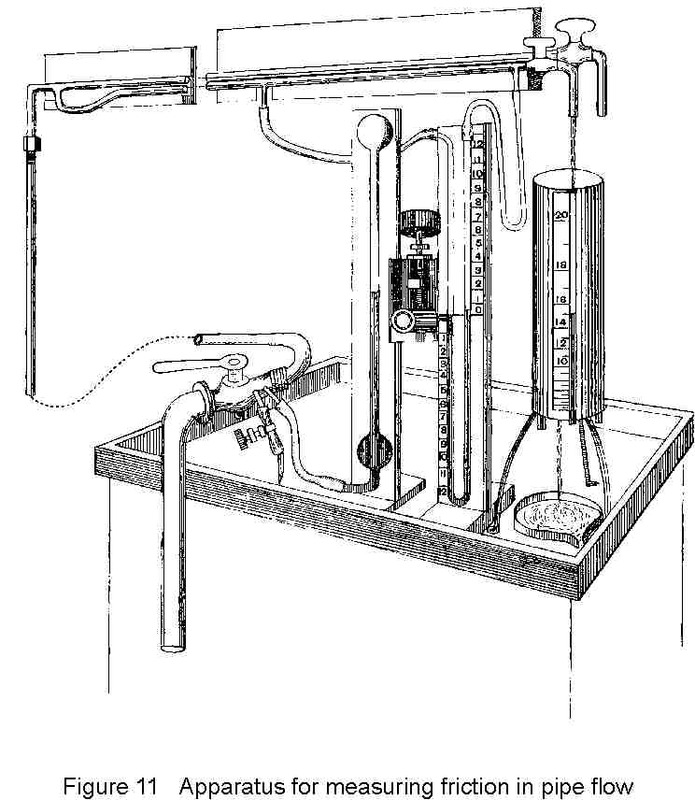 On the left-hand side is the device for introducing a streak of dye into the trumpet, while a float and dial wagister the waterer the water-level in the tank and hence the volume being discharged through the glass tube. 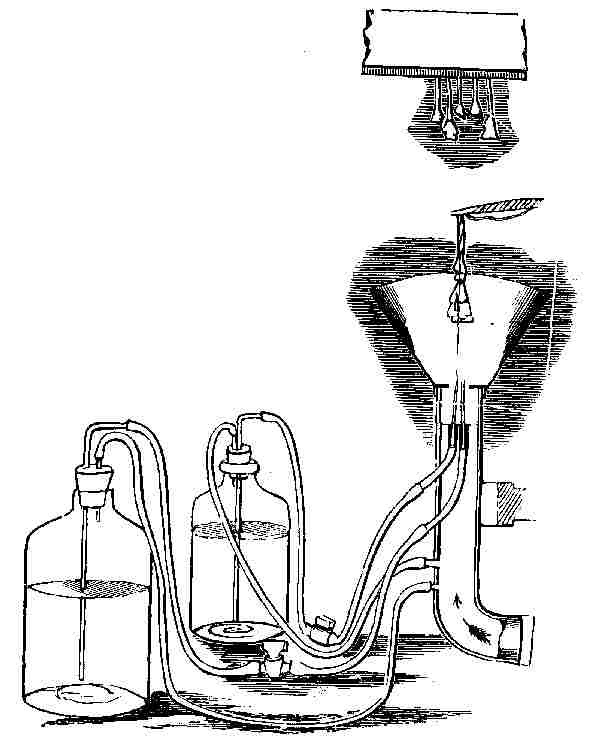 The experiments, made in 1880, consisted of filling the tank with water, allowing several hours for conditions to become steady, then opening the valve, at first only slightly. Referring to Figure 10 the colour-band established itself as a beautifully steady streak (10a) but a point was reached on increasing the flow along the tube by opening the valve still further, when `the colour band would all at once mix up with the surrounding water, and fill the rest of the tube with a mass of coloured water' (10b). `On viewing the tube by the light of an electric spark, the mass of colour resolved itself into a mass of more or less distinct curls, showing eddies.' (10c). 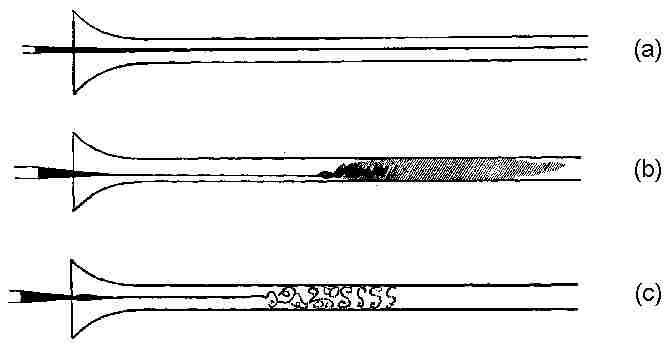 Reynolds proceeded to measure the critical velocity for onset of eddies using three tubes of different diameter and in each case varying the water temperature. To a first approximation, the Reynolds Numbers based on these critical values of velocity were found to be the same (about 13000) for each of the tubes and for all water temperatures. He then set out to find the critical condition for an eddying flow to change into non-turbulent flow, referring to this as the `inferior limit'. 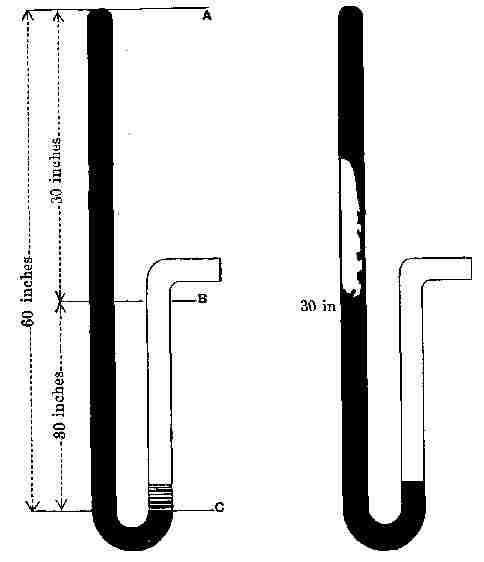 To do this, he allowed water to flow in a disturbed state from the mains through a length of pipe and measured the pressure-drop over a five-foot distance near the outlet (see Figure 11). Starting with low flows and gradually increasing them, he found that at a certain point the fluid levels in the differential manometer connected to the pressure-holes began to fluctuate: this coincided with the change in the character of the flow and provided visual evidence of the attainment of the critical velocity which he later determined by plotting the mean velocity against the pressure-gradient. Two sizes of pipe were tested. The result was to demonstrate that the critical velocities for the two pipes were in fact so related as to imply the same critical value of the Reynolds Number (about 2000). ... Professor Reynolds has traced with much success the passage from the one state of things to the other, and has proved the applicability under these complicated conditions of the general laws of dynamical similarity as adapted to viscous fluids by Professor Stokes. In spite of the difficulties which beset both the theoretical and experimental treatment, we may hope to attain before long to a better understanding of a subject which is certainly second to none in scientific as well as practical interest. In a subsequent shorter contribution entitled `On the two manners of motion of water', Paper 48 (1883), Reynolds compared the characteristics of flow in converging and diverging channels, pointing out that, whereas in the former the conditions are favourable for producing steady flow, in the latter the flow is likely to be turbulent and unsteady. This he contrasted with flow in parallel channels where below a certain flow rate steady streamline conditions prevail and above that turbulence is encountered. It was the culmination of twenty-five years of research and came as a result of Reynolds conducting `a more rigorous examination and definition of the geometrical basis on which the analytical method of distinguishing between molar-motions and heat-motions in the kinetic theory of matter is founded; and of the application of the same method of analysis, thus definitely founded, to distinguish between the mean-molar-motions and relative-molar-motions, where, as in the case of steady-mean (turbulent) flow along a pipe, the more rigorous definition of the geometrical basis shows the method to be strictly applicable.' Its origins date back to Reynolds' interests in the properties of gases at the outset of his career. Section I of the paper is a lengthy introduction which sketches the background to the work to be reported, states the objectives, outlines the approach adopted and summarises the findings. He begins by tracing the development between 1822 and 1845 of the equations governing fluid motion, the Navier-Stokes equations. He refers to the comparisons reported by Stokes in 1857 between theoretical solutions of the equations and certain experimental observations, which seemingly proved the assumptions made in the formulation of the equations. These were restricted to the drag on slowly moving objects of small size and the resistance to the flow of liquid at low rates through long tubes of small bore. These he contrasts with examples where theoretical results were found to be directly at variance with common experience in the case of the motion of larger bodies at higher velocity and the discharge of fluid through large tubes at greater flow rates. He points to the fact that Stokes was aware that the discrepancies resulted from the presence of eddies which rendered the actual motion other than that to which the theoretical solutions referred. Expressed in modern terms, Reynolds sought to write the components of velocity in a turbulent flow in terms of mean and fluctuating quantities and to perform averaging of the momentum equations. This showed that these equations contained additional terms which could be thought of as apparent stresses due to turbulence. He then derived equations for the kinetic energy of the mean motion and the kinetic energy of the turbulent motion and noticed that they contained terms, the turbulent energy production terms, which represent the total exchange of energy between the mean motion and the kinetic energy of the turbulence. To explain the occurrence of transition in channel flows Reynolds examined the conditions under which the turbulence energy could be sustained. Using the turbulence energy equation and considering a control volume for which the turbulent diffusion of turbulent energy would integrate to zero, he arrived at a condition for `the inferior limit' based on the idea that the total turbulence production must equal the total turbulence dissipation. He analyzed the particular case of flow between parallel walls driven by a pressure gradient. Using an analytical function to describe a small disturbance superimposed on a fully developed laminar flow he evaluated the total turbulence production and the total turbulence dissipation. The result was that they were in balance at a particular value of the Reynolds number of 517, based on the bulk mean velocity and the distance between the walls. It is clear that Reynolds' historic paper contained the foundations of modern turbulence modelling. The concept of turbulent stress, the role of the turbulent production terms in the exchange of energy between the mean motion and the turbulence and the dissipation of turbulence are matters which remain of central importance in the subject of turbulence. In essence he conceived the idea of the energy cascade in turbulent flows. One can take his equations for the kinetic energy of the mean motion and for turbulence energy and with little modification derive the corresponding equations currently in use. A century later the basic ideas contained in Reynolds' paper are still utilised in almost all our numerical predictions of practical turbulent flows, at least in situations close to industrial applications. We come next to a very different contribution, namely, Reynolds' theory of hydrodynamic lubrication. The stimulus for this was the important experimental research on `The Friction of Lubricated Journals' carried out for the Institution of Mechanical Engineers by Beauchamp Tower, first reported in 1883 and 1884. 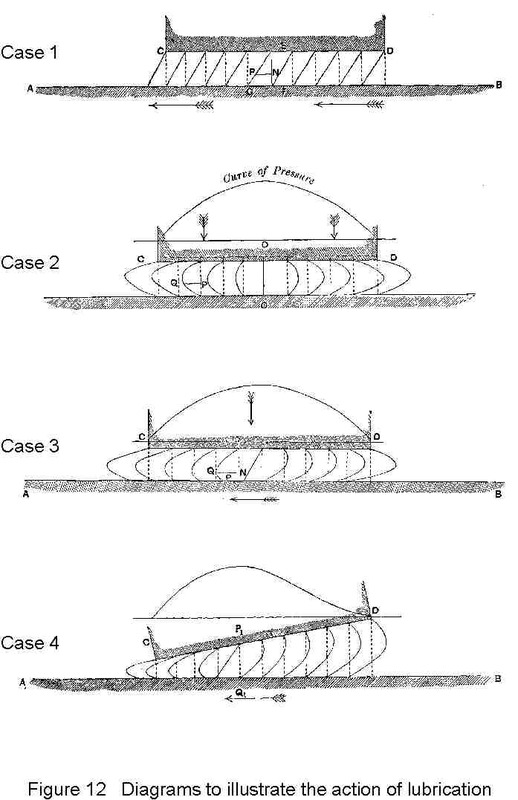 This showed that it was possible for a journal to drag oil between itself and the bearing, causing a rise of pressure sufficient to support the shaft. Reynolds realized that the maintenance of a film of oil between the shaft and its bearing might be explained by hydrodynamics on the assumption that the centre of the rotating shaft shifted away from the centre of the bearing in such a direction as to make the film of oil thicker on the ingoing than on the outgoing side. Excited by Tower's results and after a preliminary reference to them at the 1884 British Association meeting, he pursued the subject with such energy that his famous contribution `On the Theory of Lubrication...' appeared in the Philosophical Transactions of the Royal Society in 1886 (Paper 52). In this very lengthy and detailed paper, Reynolds not only formulated and integrated the hydrodynamic equations but also, by allowing for the variation of viscosity with temperature, obtained close agreement with the observed pressures. The paper provides a very good example of Reynolds' approach of discussing the physical or mechanical picture of things before proceeding with the mathematics. Under the heading `General View of the Action of Lubrication', he evolves the basic concepts involved by first considering two plane surfaces. In Case 1 (Figure 12) they are parallel to one another but AB is moving to the left with a velocity U and `pumping' fluid between itself and the stationary surface CD. The sloping lines show how the velocity varies between U at AB and zero at CD. The pressure is constant between D and C although there are tangential viscous stresses on the two surfaces. Next, he considers the same plates without tangential motion with the upper one being forced downwards to squeeze out the fluid. A pressure distribution is then created, reaching its highest value at the centre (Case 2, Figure 12). He then combines the two: tangential motion and squeezing of the surfaces together (Case 3, Figure 12). In this instance, the distribution of pressure resembles that of Case 2, while the mean viscous stress on CD is similar to that of Case 1. An interesting postscript to this giant amongst Reynolds' papers is provided by Paper 67 (1899), the final one which he read to the Manchester Literary and Philosophical Society. This is entitled `On the slipperiness of ice'. In it he proposes that an explanation of the phenomenon is afforded by the ideas on lubrication contained in Paper 52.